Tom Stoppard’s Rosencrantz and Guildenstern Are Dead— or R&G for short — is the embodiment of the oxymoron: intelligent silliness — a spontaneous combustion of coin, word and mind games, shared by two marginal characters plucked by Stoppard from Shakespeare’s Hamlet. These benighted souls don’t know what’s required of them when they’re summoned to Elsinore, and are left to find ways to entertain themselves (and us) until they can find out what they’re meant to be doing there — as well as, more existentially, in life as a whole. So Shaw, Wilde, Beckett and Ionesco, move over gently for a while. You’d think that a Stoppard play dating almost as far back as you do — 50 plus years to 1966 — might be a bit dated, no? No. Not any more than your plays are. 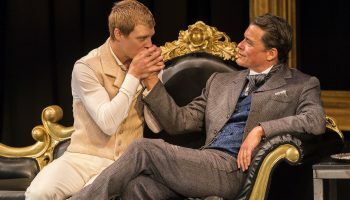 Not when an author’s contrivances cannot stop bubbling up with amusing connections that drag in even more of Hamlet’s characters to push his quirky fantasy forward. It is now frolicking at A Noise Within (ANW) in Pasadena. So brush up your Shakespeare, folks (the program helps), because prominent among the invited characters on stage, beyond Prince Hamlet, are Claudius, Ophelia, Gertrude, Polonius and that other marginalized yet highly significant subhuman group: the tattered Tragedians. They’re called Players in the original Shakespeare, and they are, by their own definition, actors, “the opposite of people,” as their leader assures us. They show up to perform a play within this play at Hamlet’s bidding. It is crafted solely to unravel Claudius, the uncle who murdered Hamlet’s father and married his mother. The players’ other important function is to deliver some of Stoppard’s most quotable lines. 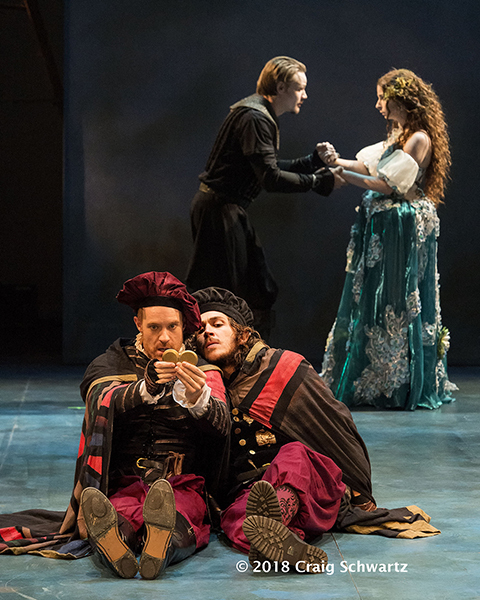 l-r, (foreground) Kasey Mahaffy & Rafael Goldstein; (background) Paul David Story & Katie Rodriguez in Rosencrantz and Guidenstern Are Dead. What a thriller. On the face of it, Stoppard’s whole attempt here is stunningly preposterous. It’s a mischievous idea that he couldn’t resist. Take two nonentities and turn them into protagonists? Well, of a sort. It does take a certain pixilated genius to have them deliver some tasty intellectual morsels and get away with it. Like Beckett’s equally static Waiting For Godot, to which R&G is related absurdistically (made up word, don’t try pronouncing it), Stoppard’s experiment in Tomfoolery has matured relatively unscathed. Perhaps its three acts could be compacted into two with no harm done but, in the end, it’s a small matter. Speaking of which — the end, I mean — it could be improved. It’s too… abrupt. Stoppard, who is quite comfortable with all this nonsense, expects a tad too much of his audience when it comes to remembering exactly who lived and who died in the carnage of the original Hamlet’s next-to-last scene. 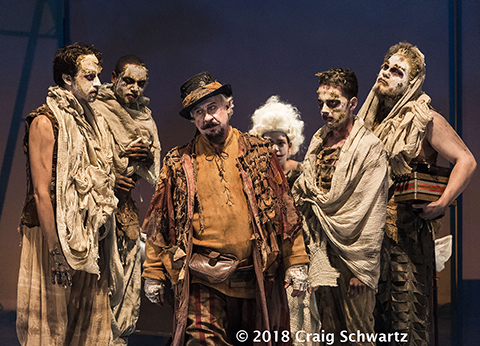 l-r, Philip Rodriguez, Matt Jennings, Wesley Mann, Sam Christian, Oscar Emmanuel Fabela, & Jonathan Fisher in Rosencrantz and Guildenstern Are Dead. It’s that kind of piece. You had to be there. It doesn’t bear repeating. You have to listen for the absence of serious content. Go with the flow and count the ways in which the little gems that pop up, and the action itself, don’t quite mirror Shakespeare. The best scenes — and best lines — involve who but the rag-tag traveling players, especially that head guy, badly rumpled and in need of a bath, played to a fare-thee-well by Wesley Mann, with inspired grandiosity and a back pocket full of tricks. Of our protagonists, Rosencrantz seems to be the breezier fellow and Kasey Mahaffy plays him with enough seriousness to convince us now and then that the breeze is not passing right through the space between his ears. Guildenstern is definitely the more calculating of the two and Rafael Goldstein’s brooding performance works to make us believe that a frown and that trace of impatience with his companion mean that he might brighter and than his friend. Until it doesn’t. 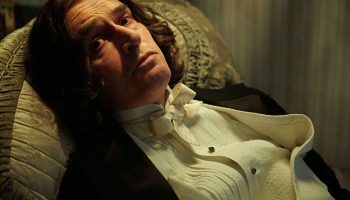 The other characters perform pretty much at the command of those three clowns, and have their roles to play, although, as Stoppard would probably acknowledge, they’re somewhat hog-tied — bound by the actions of the Big Three. Under Geoff Elliott’s brisk direction, however, all acquit themselves with distinction. 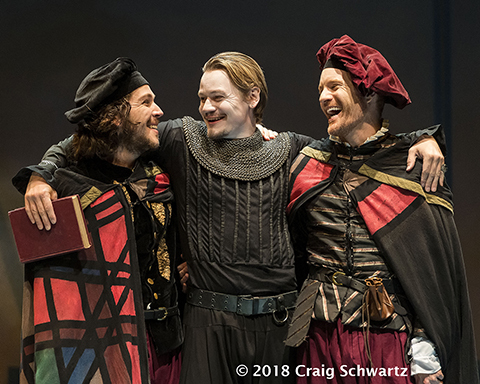 l-r. Rafael Goldstein, Paul David Story, and Kasey Mahaffy in Rosencrantz and Guildenstern Are Dead at A Noise within. Production values are serviceable, although why costume designer Jenny Foldenauer has R & G and others wearing the same or similar plaid cloaks is not clear, and scenic designer Frederica Nascimento’s idea of a sail for the ship in Act Three looks as if it belongs in a lady’s boudoir more than on a mast. But these are just hiccups. 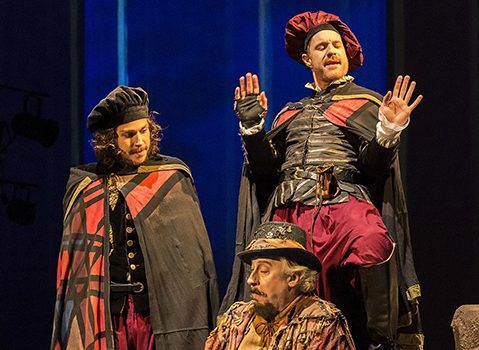 Arcadia may well be Stoppard’s masterpiece, but Rosencrantz and Guildenstern Are Dead delivers a welcome reminder of how uplifting a little existential wit can be. 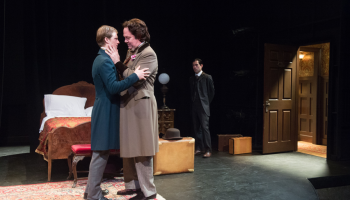 We’ll skip listing all of the awards and recognition this play received in its day, including a radio adaptation and a film version that Stoppard directed. 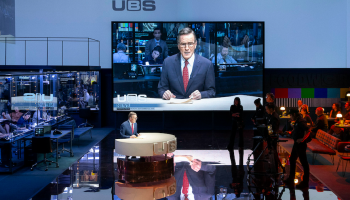 If nothing I’ve said about the play so far has convinced you about the pleasure of the oblique imagination that spawned it, the smart production at ANW should provide vivid proof. Top image: l-r, Rafael Goldstein, Wesley Mann and Kasey Mahaffy in Rosencrantz and Guidenstern Are Dead at A Noise Within. WHERE: A Noise Within, 3352 E Foothill Blvd, Pasadena, CA 91107. WHEN: Thursday, Oct. 25 – 7:30pm; Fridays, Oct 26 & Nov 9 – 8pm; Saturdays, Oct 27, Nov 10 & 17 – 2pm & 8pm; Sundays, Oct 21, 2pm; Nov 4, 17, 18 – 2 & 7pm. HOW: Tickets start at $25, available online at www.anoisewithin.org or by phone at 626.356.3121. Student Rush with ID an hour before performance, $20. Sunday Rush: Nov 4 & 18, 7pm performance only, all tickets remaining are $25, available online after 12am day of performance with the code SUNDAYRUSH or at the box office, cash or credit, after 2pm, day of performance. Groups (10 or more): Adults $25-$50 a ticket up to 35% off; Students, from $18. Call 626.356.3114 for more information.